A couple of weeks ago I helped my boyfriend make his lunch for the week. We made chicken, butter chicken sauce, Indian spiced mashed potatoes and swiss chard and radish salad. His lunches are pretty much always very meat-centric so I never taste them, let alone eat them myself. However, I couldn’t stop snacking on the mashed potatoes dipped in the butter chicken sauce. It was ridiculously good, I literally couldn’t stop eating it. I even ate some throughout the week, even though I felt bad for depleting his lunch supplies. 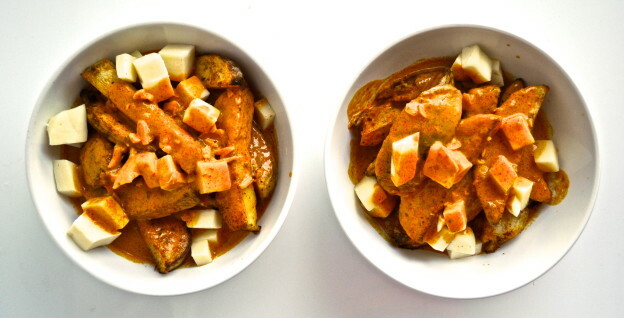 This entry was posted in Appetizer, Asian, Side dish and tagged butter chicken sauce, different poutine recipe, food, fries, gravy, indian, indian poutine, indian poutine recipe, Montreal, original poutine recipe, Potato, poutine, poutine recipe, recipe, side dish on September 5, 2013 by mysecondbreakfast.